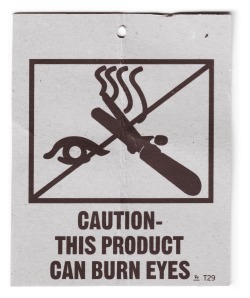 Actually, this is a helpful caution, but not for the reason you might think. I’m not sure how to end this blog post; I have nothing profound to say except maybe that vanity can be dangerous. And the human body can heal. This entry was posted in Uncategorized and tagged curling irons, Farrah Fawcett, making a mess, vanity. Bookmark the permalink. If only I had known that when I was a kid! Thanks for this–just what I needed today. I scratched my eye on my last day of a girlfriend Hawaii trip and spent the day in the ER. What was I doing? Trying to show my best friend of twenty years how I no longer have defined eyelids (like the kind you could put eye shadow on, for instance) because I now just have folded over extra-skin. Oh, the days of youth and curling irons! Yep. I burned my eye with a curling iron. Worst pain ever and I’ve had two kids and a gall bladder issue !! :( Good to have survived it!